Natural bamboo fencing is one of the most popular fencing products among homeowners because of its simplistic design and a mix of natural beige, yellow, and tan colors. It can be utilized in both indoor and outdoor projects to create the traditional paradise atmosphere. Natural bamboo is virtually termite free so it is very easy to handle and install and is considered to be one of the most environmentally sustainable products in home building and design. If you are looking for an easy, DIY fencing project, natural bamboo fencing is very simple to install on your own and is quite durable for long-term use even in the harsh outdoor weather. 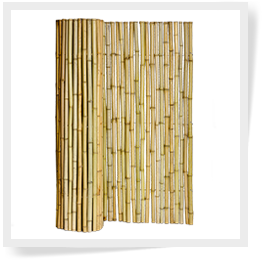 You can use natural bamboo fencing to seamlessly transform the entire ambience of your home. You will not regret the choice of using natural bamboo for fencing instead of regular pressure treated wood, which isn’t as environmentally friendly. Regular wood building materials require many more chemicals and resources to be used during the harvesting and transportation process. Using natural bamboo fencing is not only a great choice for the environment, but it can also give your home a bit more of a tropical vibe and also has the added benefit of ensuring privacy around your home. The choice to use natural bamboo in your home or garden is a great choice for durability, sustainability and traditional style. 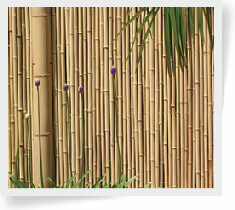 Natural bamboo fencing can be implemented into many of your projects. Sizes include: 1" X 3' X 8’, 1" X 4' X 8’, 1" X 6' X 8', and 1" X 8' X 8'. If you’re in search of traditional style fencing that’s great for the environment, you’ve found the perfect product. Our natural bamboo fencing comes standard in quality, durability, and affordability (including free shipping).